Over the years, I've written quite a few cookbooks and many are still in print. Last September, two of my older titles 101 One-Dish Dinners and The Roasted Vegetable go an update with photos. And speaking of photos: The Fat Kitchen, which will be published by Storey in November 2018 will be loaded with really beautiful photos to showcase cooking with animal fats. The Backyard Homestead Book of Kitchen Know-How came out in August 2015, and it has been fun teaching classes and giving demos in support of the book. Sometimes I bring to these events some sourdough starter to share that has a pedigree dating back to the Yukon Gold Rush of 1896 -- and there are some great sourdough recipes in the book, as well as all the harvesting, preserving, handling information you might need if you grow your own food or shop from a farmers' market. --It's like taking me home with you in book form! Pickled Pantry was the book before that, a big expansion of my very first cookbook, which was about pickling. I teach about making pickles and especially fermented pickles often. I often write about seasonal cooking, and Serving Up the Harvest and Recipes from the Root Cellar are both very dear to my heart and contain many family favorites. I took a break from vegetables to write 250 Treasured Country Desserts with my co-author Fran Raboff on, which came out in 2009. The book is an update and expanded version of Mom’s Best Desserts, which was an update and expanded version of The Great American Dessert Cookbook. The collection contains everyone’s favorite home desserts—lots of cookies, brownies, layer cakes, pies, old-fashioned fruit desserts, ice cream, and more. The New Vegetarian Grill is an updated and expanded version of an earlier book about vegetarian grilling. I’ve also written roasting vegetables (The Roasted Vegetable), and healthy eating (366 Delicious Ways to Cook Rice, Beans, and Grains). Then there is also Mom’s Best One-Dish Suppers and Mom’s Best Crowd-Pleasers, and a few more that are now out-of-print. My work has appeared in Mother Earth News, Edible Green Mountains, Cooking Light, Vegetarian Times, Organic Gardening, Fine Cooking, Food & Wine, Natural Health, and several other magazines and newspapers. I was a contributing editor for Vermont Life for twelve years. I live in an old farmhouse in Ripton, Vermont, a very small town where early and late frosts make gardening challenging. The poet Robert Frost used to rent a cottage across the street and took his meals in our house, in what we now call “the Robert Frost Memorial Dining Room.” I am married to Richard Ruane, a marvelous musician and recipe taster. Our kids, Rory and Sam, are also excellent cooks and enthusiastic recipe tasters. They serve as great inspiration for me. Project development and management, manuscript evaluation, substantive editing, copyediting, Americanizations, and indexing. Specializing in cookbooks, gardening books, health, how-to. Garden Way Publishing, Charlotte, Vt., 1980-1983. Stackpole Books, Harrisburg, Pa., 1978-1980. The Good Home Cookbookby Richard Perry (Collector’s Press) 2006. Noodle Fusionby Dorothy Rankin (Crossing Press, Freedom, Calif.) 2000. The Big Book of Gardening Skills by the editors of Garden Way Publishing (Storey Communications, Pownal, Vt.) 1993. Gardener's Questions Answered by The National Gardening Association (Villard Books, New York) 1987. Gardening: The Complete Guide to Growing America's Favorite Fruits & Vegetables by The National Gardening Association (Addison Wesley, Reading, Mass.) 1986. The PrisonGarden Book by Nancy Flinn (National Gardening Association, Burlington, Vt.) 1985. Joy of Gardening Cookbook by Janet Ballantyne (Garden Way Publishing, Pownal, Vt.) 1983. Recipes from the Root Cellar. Expected pub date, July 9, 2010. (Storey Books, North Adams, Mass.). Serving Up the Harvest Paperback edition of Garden-Fresh Vegetable Cookbook. (Storey Books, North Adams, Mass.). 2007. Mom’s Best Crowd-Pleasers. (Storey Books, North Adams, Mass.). 2006. Mom’s Best One-Dish Suppers.Incorporates recipes from Salad Suppers and Skillet Suppers. (Storey Books, North Adams, Mass.). 2005. Mom’s Best Dessertswith Fran Raboff. Expanded new edition. Previously published as The Great American Dessert Cookbook. (Storey Books, North Adams, Mass.). 2002. Out of print. The Vegetarian Grill (Harvard Common Press, Boston, Mass.). 1998. James Beard Cookbook Award nominee, Books for Cooks Book Club Selection, 1999 NBBQA Award of Excellence. 366 Delicious Ways to Cook Rice, Beans & Grains (Plume Books, New York). 1998. A Books for Cooks Book Club Selection. Salad Suppers (Chapters, Boston, Mass.). 1997. A Books for Cooks Book Club Selection. Out of print. YankeeChurch Suppers & Potluck Dinners by Andrea Chesman and the Editors of Yankee Magazine. (Villard Books, New York). 1996. The Busy Person’s Guide to Preserving Foodby Janet Chadwick, updated and revised by Andrea Chesman (Storey Communications, Pownal, Vt.). 1995. Book Club Selection. Out of print. The Great American Dessert Cookbookwith Fran Raboff(Crossing Press, Freedom, Calif.) 1990. Out of print. Sun-Dried Tomatoes! (Crossing Press, Freedom, Calif.) 1990. Out of print. Sauces for Pasta! by Kristie Scott with Andrea Chesman (Crossing Press, Freedom, Calif.) 1990. Out of print. Salsas! (Crossing Press, Trumansburg, N.Y.) 1985. A Better Homes and Gardens Book Club Selection. Out of print. Summer in a Jar: Making Pickles, Jams, and More (Williamson Publishing Co., Charlotte, Vt.) 1985. Out of print. Pickles and Relishes: 150 Recipes from Apples to Zucchini(Garden Way Publishing, Pownal, Vt.) 1983. A Better Homes and Gardens Book Club Selection. Guide to Women's Publishing(Dustbooks, Paradise, Calif.) 1978. Out of print. 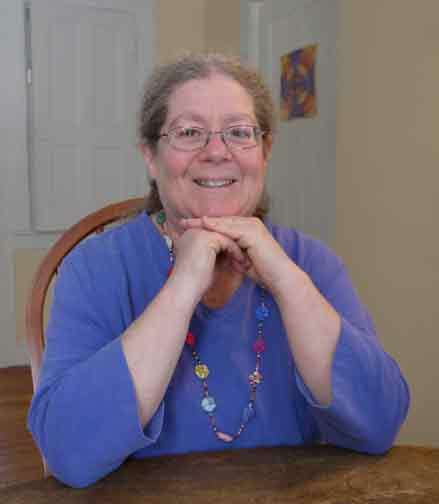 Contributing Food Editor, Vermont Life, 1988-2001. Natural Health, Vegetarian Times, Cooking Light, Eating Well, Fine Cooking, Food & Wine, New York Times, Organic Gardening, Quick & Healthy Cooking, Harrowsmith Country Life, National Gardening Magazine, New England Monthly, Vermont Dining, Burlington Free Press, Vermont Times, Vermont Vanguard, Teago's Guide to Lake Champlain, New Age Magazine, Rocky Mountain News, Denver Post. Cornell University, Bachelor of Science, 1974. University of Denver, Master of Library Science, 1980.